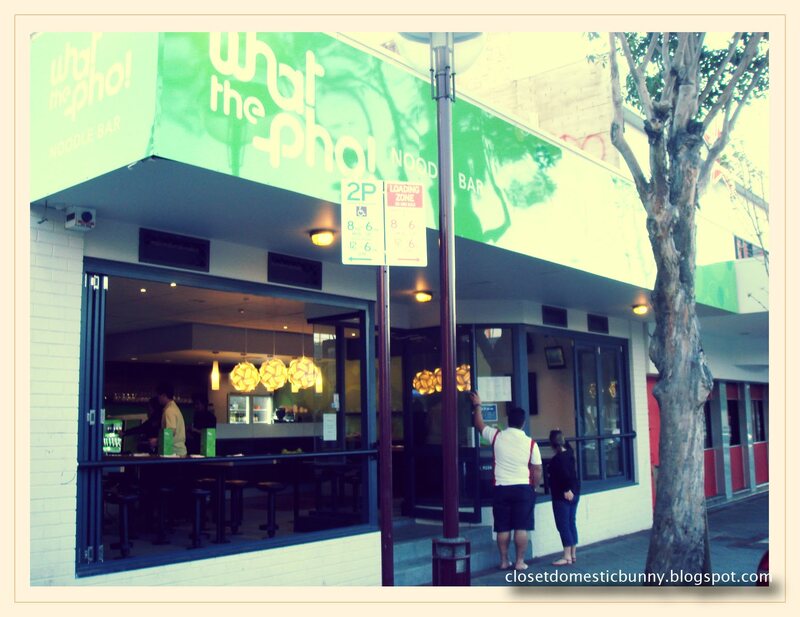 A few weeks ago, my brother-in-law wanted to try out this newly opened Vietnamese noodle (Pho) shop in Northbridge. It’s funny that he couldn’t remember the name of the shop at first. I mean who could forget a witty name such as “What The Pho”. The restaurant was decorated in a modern, minimalist style. It had a green colour scheme that reminded me of freshly cut grass. The restaurant was furnished with a mixture of bar tables (where other customers can sit next to you) and family table (where it’s exclusively your table). We sat at one of the bar tables. We came quite early (6pm) for dinner, so we didn’t share our table with anyone else. Menus were already sitting on the tables, awaiting our perusal. Service was quite efficient, if not over-eager. 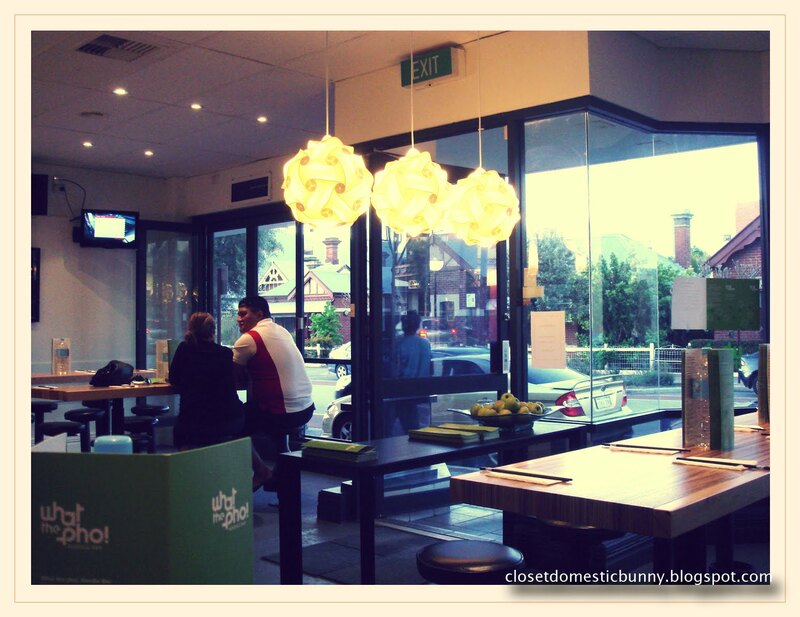 I found that the waitperson serving us, eventhough quite friendly, was not very knowledgeable about the food. She seemed to be making up the answers as she went. To say I rarely have Pho is probably an understatement. This was probably the third time in my life that I had Pho. I can’t quite remember how it was the other two times, so I don’t have the best judge of what a good Pho is supposed to be like. My sister and brother-in-law, however, is another matter. 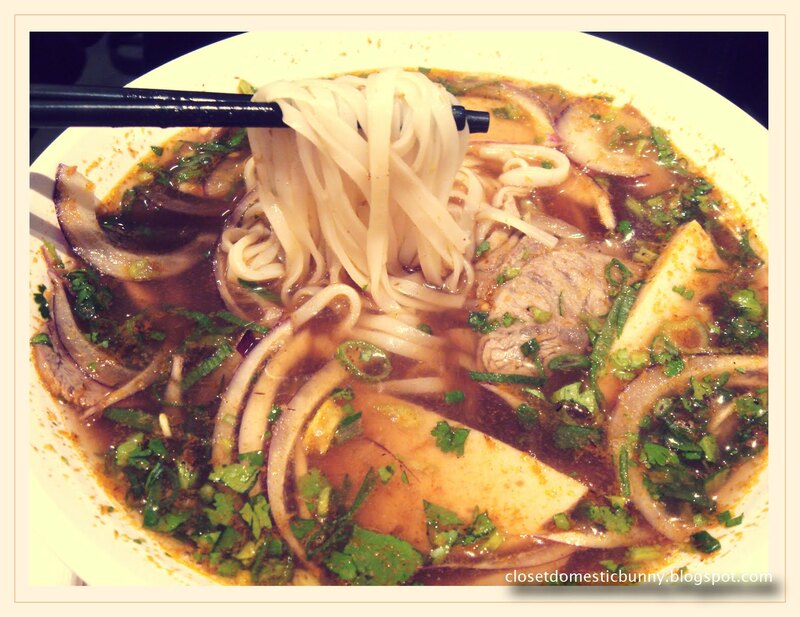 They have Pho all the time, so in this case, I trusted their taste more than mine. 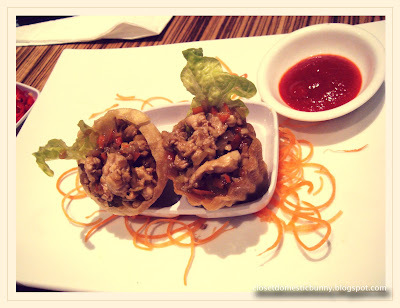 We ordered an appetiser called top hat, which were crispy pastry shells filled with minced chicken and vegies. I didn’t find myself raving about it, nor do I object to it. 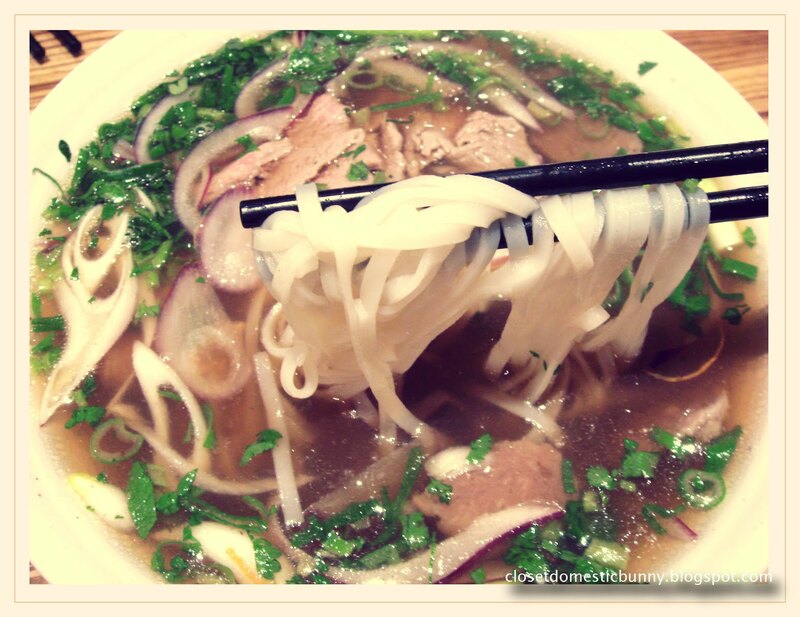 For the mains, I had the phở tái bò viên, which was rice noodle in soup, accompanied with slices of beef, beef balls and onions, which I then topped with copious amounts of bean sprouts. I forewent the mint because I don’t like them, but we didn’t let anything go to waste as my brother-in-law ate them all. 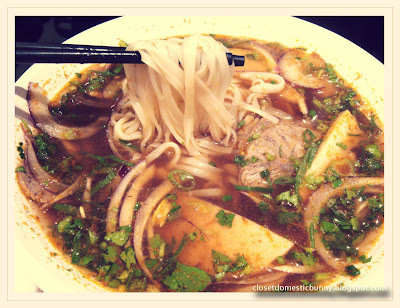 My sister had the bún bò huế, a bowl of spicy beef noodle soup with sliced beef, sliced pork and onions. My brother-in-law had the phở đặc biệt, which was basically the same dish as mine, but with the addition of raw beef slices and slow cooked beef. I found that the vegies were all fresh and fantastically crunchy. They really gave the dish the much needed texture. The beef balls and beef slices were also yummy. The broth I found was a bit lacking, not meaty enough for my taste. The noodle, however, was the biggest disappointment of all as it was not al dente. It fell apart as soon as I tried to gently tug it with my chopsticks. At first, I didn’t say anything, because I thought it was supposed to be that soft. I also wanted my sister and brother-in-law to make up their own mind before I made it for them. But then my sister pointed out that her noodle was definitely overcooked, which was summarily agreed to by my brother-in-law. We had a long conversation about the meal afterwards and we agreed that, while the noodles were overcooked, the freshness of the ingredients saved the day. But, in a scale of 1 to 10, at best it was just a meh. What my sister said pretty much summed it up, “It was alright. I mean, if someone wanted to come here and asked me to go with, I wouldn’t have a violent reaction to it”. "But, in a scale of 1 to 10, at best it was just a meh." "meh" is not on a sale of 1 to 10. meh is a word, not an integer. uhmm.... seems like someone is holding a grudge because of something. not sure that this is a constructive feedback. but thank you for commenting.